Severe weather made its return to Logan County late Tuesday evening with two tornado warnings and a flash flood warning being issued. The storms brought heavy rains, which led to a bridge being completely washed away. The National Weather Service issued the first tornado warning at 9:50 p.m. for the towns of Orlando and Mulhall. The second warning came at 10:38 for Crescent and Lovell. The last warning expired at 11:15. The second storm had a bulls-eye for north Guthrie, but the storm switch directions from southeast to east toward Langston and Coyle. A storm spotter spotted a funnel cloud north of Crescent, but there were no reports of any tornadoes reaching the ground. However, the storms still left their mark. The high winds knocked down a utility pole near Orlando while the flood waters took out a bridge west of Orlando at County Road 60 and east of Coltrane Rd. 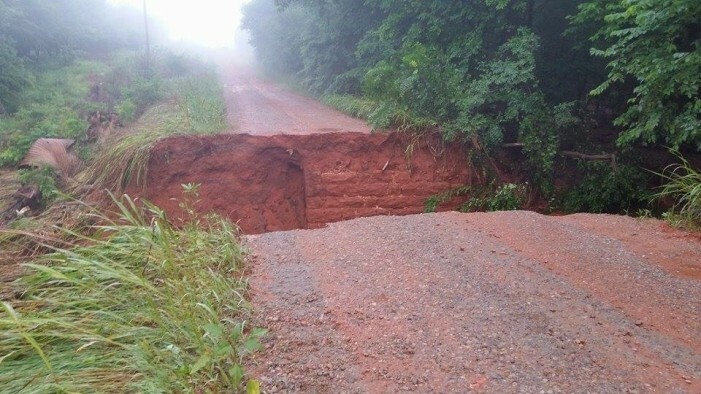 A Logan County deputy arrived to the hole in the road with no signs of a bridge anywhere to be seen. The deputy stayed on the scene until road barricades were brought in. Portions of the storm’s path received up to four inches of rain in just an hour as the storm moved slowly across the county. One Response to "Tornado and flash flood warnings cause havoc in Logan County"